Check out this cement pot, which is in gray color and has a matte finish. This pot is made from good quality cement and will last for ages. 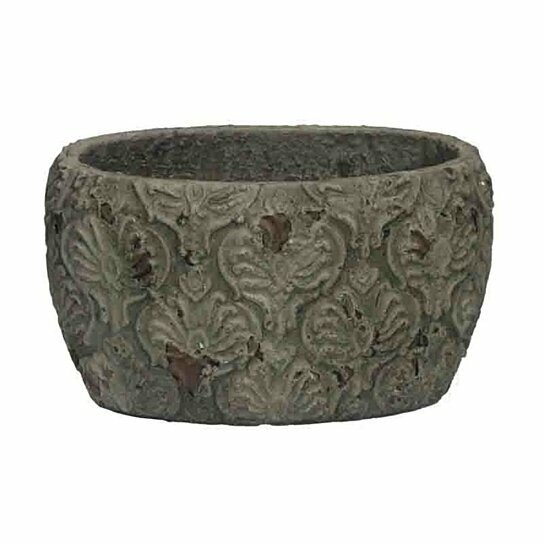 Shaped in oval, the exterior features lovely foliage carvings. You can use it as a flowerpot outside or inside keep it on the side table as a showpiece. You can keep it as it is or fill it with colorful stones. Get a couple of these pots and arrange it on the side table in the entryway. It is sure to add a distinctive look to that place. Distressed texture showing peel off effect.